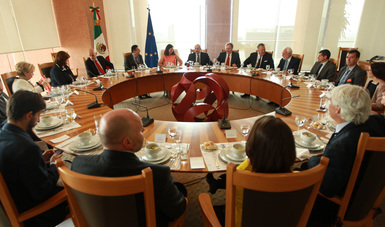 Delegations from Mexico and the European Union (EU) met in Mexico City today for the second round of negotiations to update the political and cooperation aspects of the Economic Partnership, Political Coordination and Cooperation Agreement (Global Agreement) that was signed in 1997 and has been in force since 2000. The first round of negotiations took place in Brussels, Belgium last June. It focused on organization and working methods, but there was also a first exchange of ideas on the contents of the new agreement. Ambassador Carlos de Icaza, Undersecretary of Foreign Affairs, and Ambassador Agustín García-López, Executive Director of the Mexican Agency for International Development Cooperation (AMEXCID), led the second round of negotiations for Mexico, while the EU was represented by its chief negotiator, Ambassador Edita Hrdá, Executive Director for the Americas of the European External Action Service (EEAS). The European Commission's Director for Development Coordination-Latin America and Caribbean, Jolita Butkeviciene, also took part in the negotiations. The round concluded with a substantive degree of agreement on a number of issues relating to the political dialogue and bilateral, multilateral and international development cooperation. The two sides agreed to hold a third round of negotiations on political and cooperation topics in Brussels, Belgium, on July 10. The delegations reaffirmed their commitment to conclude negotiations this year. The goal of the negotiations is to strengthen the strategic partnership and the political dialogue, and to increase cooperation and coordination on foreign policy, security policy and global issues, in order to be better prepared to respond to our shared challenges in today's world.